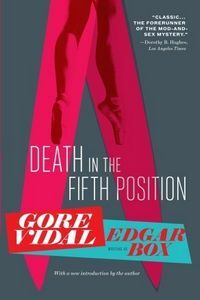 Death in the Fifth Position by Gore Vidal writing as Edgar Box, a Mysterious Review. Review: In the early 1950s, Gore Vidal — using the pseudonym Edgar Box — wrote a series of three mysteries featuring New York City public relations manager Peter Cutler Sargeant II. Vintage Crime is re-issuing these books with new introductions in each by the author. Death in the Fifth Position introduces Sargeant, a former newspaperman who now handles publicity as an independent agent. Though young, he is familiar with the arts (having reviewed the theater scene for several years) and has maintained cordial relations with his former colleagues. But when ballet producer Ivan Washburn interviews Sargeant for an assignment, he has his doubts. "Well, there's the matter of these pickets." I don't know why but the word "picket" at this moment suggested small gnomes hiding in the earth. So I said, "Ah." "They are coming tonight," he added. "What time do they usually come?" I asked, getting into the spirit of the thing. "I don't know. We've never had them before." Never had them before, I wrote in my notebook, just to be doing something. "You were very highly recommended to me," said Mr. Washburn, in a tone which was almost accusing; obviously I had given him no cause for confidence. The ballet's choreographer is suspected of being a Communist, and Washburn needs Sargeant to use his influence with the city's columnists to focus their attention on the show, not the man's politics. But the show gets all sorts of publicity on its own when the star, Ella Sutton, is murdered, dropped from an intentionally frayed cable from which she was suspended during the ballet's opening performance. The prime suspect — indeed, about the only suspect — is her husband, Miles Sutton, the production's orchestra conductor, who Sargeant overhears threatening to kill her. (It gave me quite a turn. I mean temperament is all very well but there are times when it can be carried too far.) But the murder investigation seems to come to a standstill when Miles is later found dead. Peter Sargeant is an urbane, witty character and his interactions with the mercurial ballet troupe are entertaining in and of themselves. Written in first person, he's never at a loss for words to describe what's going on around him. But the real treat here is how cleverly crafted the murder mystery plot is. Though relatively short at just over 200 pages, the interrelationships between the characters are deftly woven into the story. And when the police seem to be at a loss as to how to proceed following Miles Sutton's death, Sargeant steps in and puts the pieces together for them. The two sequels to Death in the Fifth Position are Death Before Bedtime and Death Likes It Hot, copies of which were also received by the publisher but, due to time constraints and not lack of interest, are not reviewed here. Acknowledgment: Random House provided a copy of Death in the Fifth Position for this review.